In the heart of green nature, it is just ideally situated in a dead alley: The fine sandy beach is at a walking-distance of only 100 m; following the small path leading directly from the premises of Villa Torre delle Viole to Calanca beach it is even shorter. Water freaks can not only take a swim in the nearby sea but also in the swimming pool withsun terrace, open for all guests of the Villa (in common with Villa Maricarmen). You can also use the sauna and fitness room (see picture gallery). After only 200 m you will find the first bars, restaurants and shops, with the gorgeous piazza hardly farther away. Its proprietors, the teacher Maricarmen and the architect Signor Nicola Greco, did - when planning the house - not only pay attention to its location but also to a harmonious concordance of house and landscape. The apartments are modern, of high value and stylishly furnished. Four apartments are with one bedroom (B) resp. two bedrooms each (A). 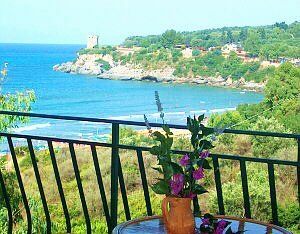 On the spacious balcony (with view of the sea or the garden) you can spend wonderful evenings, listening to the roaring of the sea and to the songs of the cicadas. Should it once be too cool, you will feel very comfortable inside the apartment (fitted kitchen, table/chairs, daybed, TV, W-LAN, heating). All apartments have a bathroom with shower, WC and bidet. A washing-machine can be shared by all the guests. The car park is situated within the fenced estate. Marina di Camerota, 6 km from the medieval town Camerota, has remained a lively Italian fishing village. The bars are still the centre of village life, at night people stroll along the well-tended promenade of the harbour. In the narrow alleys you will – every now and then - meet old women and men, their donkeys burdened with purchases or firewood. Marina di Camerota is one of the most beautiful coastal towns in the Cilento; for this reason it is very popular in Italy and quite frequented during the Italian holidays in July and August. Your sports facilities: Swimming, Hiking, Cycling, Diving, Tennis, Mountanbiking, etc. Please note our terms of contract and the separate terms of payment of the landlord (deposit of 30% within 7 days after receiving the confirmation of booking, the remaining amount of 70 % is to be transferred until 28 days before departure). A washing-machine can be shared by all the guests (for a fee). The car park is situated within the fenced estate. Marina di Camerota, 6 km below the medieval mountain village of Camerota, has always been a lively Italian fishing village. When we stopped there in 1999, we were fascinated at once: Some first tender contacts, followed by the first holiday homes and holiday apartments in our offer, then started off the 'journey' of „Cilentano“. Those who spend a holiday at Marina di Camerota today, meet with an Italy of times long gone. The bars are still the meeting point of half of the village population, at the 'panificio’s' people chat about anything and everything and exchange the latest news. In the evenings, they stroll along the well-tended promenade of the harbor or sit together playing a lively game of cards. Almost all year long, life' takes place' at the harbor or in nearby piazza Domenico. The square is dominated by the sunny yellow church of the same name; there are days on which you can watch the hustle and bustle in its shade for hours. In the green hills above the town center you find more peace and quiet. In the course of the last century, numerous chic villas with ample premises and wide coastal panoramas were built in the districts of Monte di Luna and Previteri. Nowadays, they are popular holiday accommodations, above all with foreign vacationers. It is this special mixture of maritime tradition, beach, nature and sea for which Marina di Camerota doubtlessly counts among the most beautiful coastal towns in Southern Italy’s Cilento. The advantages of the fishing village are much appreciated by a large number of Italians from Rome, Naples or Salerno who often call a holiday home or holiday apartment there their own.